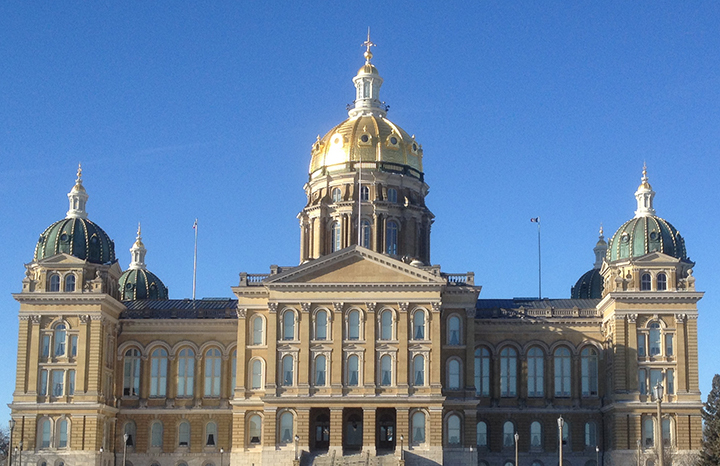 The Republican-led Iowa House of Representatives, by voice vote, moved four more bills to conference committee on Wednesday afternoon. The first bill sent to conference, Senate File 496, was the Senate’s Judicial Branch appropriations bill. The Senate had rejected a House amendment earlier in the day, and the House responded with a motion to insist – a procedural move that results in referring a bill to conference. Next, the House sent Senate File 494, the Iowa Department of Agriculture and Land Stewardship, Iowa Department of Natural Resources, Iowa Environmental Protection Commission, et al. appropriations bill, to conference. Then, it moved on Senate File 499, the Iowa Economic Development Authority appropriations bill, also sending that to conference. The final bill sent to conference was Senate File 497, the justice system appropriations bill. All of the motions to insist were handled by voice votes. There will likely be more bills joining these, as well as the state percentage of growth for supplemental school aid, in going to conference. The House refused to concur with Senate amendments to House File 659 – the administration and regulation appropriations bill – and House File 658 – the education appropriations bill. Representatives voted to concur with a Senate amendment, which they further amended, to House File 635, the transportation omnibus bill. The House amendment to the Senate-amended version of HF 635 restored the original House provisions for uninsured motorists and removed a Senate-installed amendment to make texting while driving a primary offense. The bill had broad, bipartisan support, passing on an 84-12 vote. 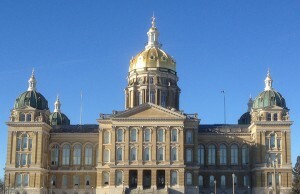 Earlier in the day, during a morning session, representatives took up House File 655, the Iowa Cell Siting Act, which establishes application rules and limitations for wireless communications facilities and infrastructure, and modifies provisions related to reinvestment districts and flood mitigation projects. There was significant debate over Republican amendments, including one that was ruled not germane, but was still adopted, but the bill as a whole was passed on a 59-39 vote. Prior to that, the House had quickly adopted a number of bills. House File 631, which establishes first-time home buyer savings accounts with tax incentives, passed by a 91-7 margin. House File 653 – an act to modify the Disabled Veteran Homestead Tax Credit; property tax exemptions authorized for certain associations, institutions, and societies; the definition of livestock for purposes of the sales and use tax; and exempt certain all-terrain vehicles and off-road utility vehicles from the sales and use tax – then passed on a 97-1 vote. House File 660, an act to require a public hearing prior to increasing the rate of a franchise fee imposed by a city, was then adopted unanimously. After that, the representatives approved House File 662 – an act to amend Iowa Code as it relates to access to birth records and vital statistics fees collected by the state and county recorders – on a 79-19 vote, despite some misgivings by Democrats who were opposed to county recorders charging fees when searches turn up no records.